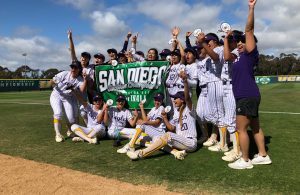 With neither teams offense able to do anything the game was scoreless until the top of the fifth when Mission Hills broke through. Starting off was Abrianna Schwartz who singled, Ally Amato walked. Eagles pitcher Staci Chambers (1-2, RBI) was able to retire the next two batters but the runners advanced. With two outs Ari Quinones ripped a single to center that scored Schwartz that put the Grizzlies up 1-0. Granite Hills went to business in the bottom of the inning with a lead single by Julia Tysling (1-3, 2R) which was followed by a smash double to left by Brooke Bertussi (2-3, 2R, RBI, 2 2B). With runners on second and third and no outs, Erica Simon (1-3, R, RBI) knocked in Tysling as she singled to tie the game 1-1, a couple batters with two outs Chambers is intentionally walked, Aylani Ottley in to run for Chambers, the bases are loaded for Bailey Wallace (RBI) who walked to score Bertussi to give the Eagles a 2-1 lead, Amaya Esparza is hit by a pitch which scored Simon to give the Eagles a 3-1 lead. Granite would add more runs in the bottom of the sixth as Bertussi again does the damage as she ripped a double to center field which scored Tysling and made it 4-1, McKenzie Boehm (1-3, R, RBI, 2B) with one out roped a double to score Bertussi and make it 5-1. The final run for the Eagles came when Chambers singled to score Boehm with two outs. The five run lead would be all Chambers needed in the top of the seventh as she retired the first two batters before walking Autumn Poppet. Despite the walk, Chambers retired Quinones on a lineout that was caught by Bertussi to procure the victory. The loss snapped the Grizzlies two game winning streak while the win for the Eagles was their eighth in a row. In the loss for the Grizzlies, Riley Burcin went 6 innings giving up 6 runs of which 4 were earned on 6 hits while walking 6 and striking out 4. Chambers for the Eagles went the full 7 innings to get the complete game victory as she only gave up 1 run which was earned on 3 hits while walking 5 and striking out 5. For their efforts, Chambers was named the Pitcher of The Tournament and Bertussi was named the Most Valuable Player. 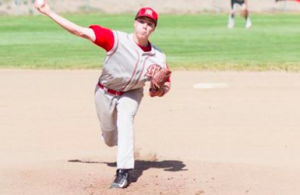 With the pitching strong on both sides, both teams knew something had to give and the Eagles took advantage of their opportunities and held on to claim the win over the Cougars. 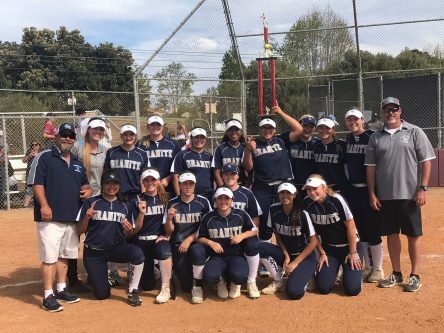 Granite Hills got on the board first in the bottom of the second inning as Amaya Esparza reached on a fielder’s choice, Aylani Ottley (RUN) came in to run, she would come around to score on a base hit to center by Kara Blanchard (1-3, R, RBI) to make it 1-0. Still leading by a run in the bottom of the fourth the Eagles knew they had to score some insurance runs. 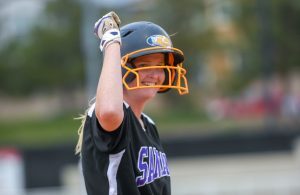 Leadoff hitter Staci Chambers (1-3) singled, Erica Simon in to run, Bailey Wallace (2-3, R) laid down a bunt for a single, Blanchard a couple batters later reached on an error to load the bases. The next batter Sydney Huse hit into a fielder’s choice in which Simon was out at the plate. With two outs up stepped Brooke Bertussi (1-2, 2 RBI) who took a 2-2 count and blooped it to right field for a hit that allowed both Wallace and Blanchard to score to give the Eagles a 3-0 lead. 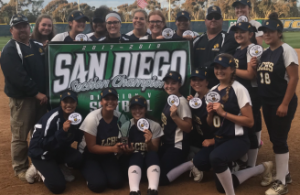 The Cougars hadn’t done anything offensively until the top of the sixth and even than they took advantage of scoring a couple runs without a base hit as Granite Hills made a couple miscues. Moving to the top of the seventh and now only leading 3-2, Chambers gave up a lead walk but settled as she retired the next three batters to end the game. Chambers for the Eagles went 7 innings for the complete game victory in which she gave up 2 runs on 3 hits while walking 3 and fanning 10 on the day. 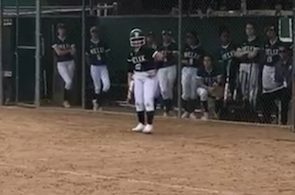 The Grizzlies behind a Catie Villalobos three run homerun in the bottom of the third scored eight runs to lead 9-0 and never looked back. 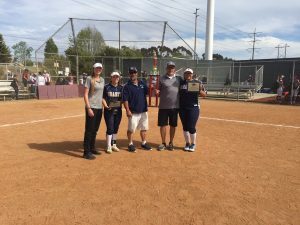 Steele Canyon who trailed heading into the top of the fourth finally got something as JJ Venzor (1-3, 2R, 2 RBI, 2B) walked with one out, she advanced to third on a single to right field by Bianca Morales. The next batter Tayler Thomas hit a ball to second base that was misplayed which allowed Venzor to come in and score to make it 9-1. The Cougars tried to make a small comeback in the top of the fifth as Jazmin Alvarado (1-2, R) led off with a single which was followed by a roped double to right field by Audrey Bagge (1-4, R, 2B). A couple batters later with one out and runners on second and third Venzor smashed a double to right field that scored both Alvarado and Bagge to make it 9-3. The Cougars would add another run as Bianca Morales with two outs reached on an error which allowed Venzor to score to make it 9-4. For the Grizzlies in the victory, Autumn Poppett went 7 innings giving up 4 runs of which 2 were earned on 4 hits while walking 2 and striking out 3. Early on Grossmont took advantage of opportunities in the bottom of the first inning to push across a couple runs to take an early 2-0 lead. Both Kimmy Bond (1-2, R) and Kati Contreras (1-3, R, 2 RBI) who reached on an error with two outs advanced up on a dropped third strike swinging against Samaria Roope. In fact, the ball got by the catcher for a passed ball which allowed Bond to come into score. Aly Allmann (2-3, RBI) came up next and singled to score Contreras. The Longhorns in the top of the fourth would tie the game as Farrah Steffany tripled to score a run and Kaylee Hull singled which scored Steffany. However, in the bottom of the fourth inning, the Foothillers struck back. Starting with a one out walk by Jessica Medlin (1-1, R), Rainee Foster (1-2, R) singled, Medlin advanced to third on an error by RBV, Foster steals second, Bond walked to load the bases and Contreras roped a single that scored both Medlin and Foster to give the Hillers a 4-2 lead. Rancho Buena Vista would scratch across their final run in the top of the fifth inning on a Hull RBI single. Taking the loss for the Longhorns, Steffany went 4 innings while giving up 4 runs of which 2 were earned on 4 hits, walked 4 and struck out 8. Roope for the Hillers got the win tossing a complete game 7 innings in which she gave up 3 runs of which 2 were earned on 7 hits while walking 1 and striking out 2. The Titans would go on to score two runs in the bottom of the seventh which included a sacrifice bunt to win the game. Eastlake would take an early 2-0 lead with runs in the bottom of the first and second innings before the Wolf Pack got a run back in the top of the fourth inning. The Pack thanks to a leadoff single by Haley Valles (1-3, R) leadoff single and a couple batters later Ashleigh Hartwig’s (1-3, RBI) base hit to center that scored Valles cut the Titans lead 2-1. Things got even better for the Wolf Pack in the top of the fifth inning as Carly Bursch (1-3, 2B) led off with a double, Mia Colabella (RUN) came into run, she would score a couple batters later as Dakotta Mershon (RUN) reached on an error which tied the game 2-2. The next batter Jules Fossing (1-3, R) singled, A couple batters later Alyssa Bubar (RUN) came into hit and she walked to load the bases, Hartwig would hit a ball to short that was misplayed which allowed the Pack to take the lead as Mershon, Fossing and Bubar all came into score which gave the Wolf Pack a 5-2 lead. Eastlake got a run back in the bottom of the inning on an RBI double to pull within 5-3. They again would push across a run in the bottom of the sixth to make it a one run contest. West Hills in the top of the seventh would only get Fossing on base as she reached on an error. The Titans down to their final at-bat started things off with a walk, a sacrifice bunt in which everyone was safe and put runners at first and third, another sacrifice bunt scored the runner at third to tie the game 5-5. Taking the hard-luck loss for the Wolf Pack was Bursch who went 6.1 innings giving up 6 runs of which 5 were earned on 10 hits while walking 5 and striking out 7. In a contest that was decided late, the Falcons pulled out the victory as Desiree Rivera drove in Kaiya Vandemark in the bottom of the sixth for the only run of the game. The Patriots unfortunately, couldn’t get the bats going as they were limited to only three hits on the day. They threatened in the top of the fourth inning as Ari Rios singled, Jessica Dewitt with two outs singled to give the Patriots runners at first and second. However, the Falcons would get out of the inning. Laila Spracklen would take the hard-luck loss for the Patriots as she only gave up 1 run on the day.